Delhi Traffic Police (DTP) has taken a giant lead in using social media and promoting breach of law through it. Either we are too naive or Motor Vehicle Act is too complex for us to understand. Both these images were taken by people commuting in the vehicles coming from behind. And in most probabilities, it was the driver who shot. These Facebook cops are using mobile phone cameras while driving. 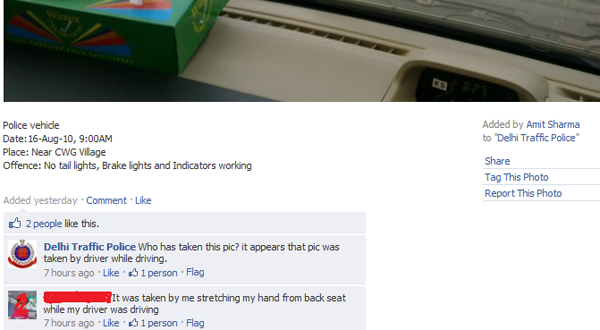 If the section 184 is used in spirit all the click happy drivers on Facebook should be paying Rs 1000 /-. Look at this smart chap proving team TOS’s point on the FB. Team TOS appeals to the DTP to do some pragmatic thinking and buy some cameras instead of depending on citizens who are risking their life and causing chaos to get a ‘thanks’ from you. It’s a dangerous game – please stop it – and has all the potential to embarrass you. This entry was posted in Uncategorized and tagged Delhi Traffic Police, Delhi Traffic Police on Facebook, Facbeook page, Social Media. Bookmark the permalink. 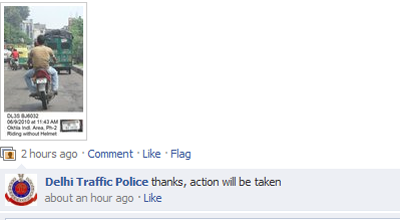 Well I like the Heading “Delhi Traffic Police promoting crime on Facebook”. While in one of the pics posted here DTP asked “who has clicked the Pic?”. On a numerous occasions DTP and other members have suggested that Drivers should refrain from using camera. I guess this can be termed as “Promoting Crime” by blaming people who might or might not be committing the crime. In Bargain save the people who actually committing the crime. I guess we should be more sensible while making the statements. Thanks Mr Sharma for your kind comment. People should be encouraged to become law abiding citizens not to enforcers / keepers of law. I would say people should be encouraged to report if they see a crime being committed. In fact what they are doing on FB is reporting only neither they are enforcers nor keepers. Yes we agree and means of gathering evidence should be fair. Facebook – Can you trust?